When it comes to planning an event or running a business, stamps are a helpful addition to your arsenal for many reasons. When running an attendance-based business, hand stamps let you show important information such as guests under the drinking age or proof of admittance in place of tickets. Whether at a nightclub, theme park, or other themed event, invisible ink products can add an extra element of fun to the party. With this type of ink, also called UV ink, it will only show under a blacklight. We offer many options for invisible ink products to add to the life of your next party or event. All of the invisible ink we offer has been tested and approved as safe to use on skin. This non-toxic formula is semi-permanent. Ink cannot be washed away by water or sweat. It can be removed with soap and water or it will self-evaporate from skin within 2-4 days. It offers quick drying times of no more than 15 seconds for an ideal solution for high-traffic events. Aside from the ink itself, our inventory has all of the other necessities you need to incorporate this type of solution in your business or event. We offer stamps in sizes small enough to be carried easily in a pocket with their lightweight construction. 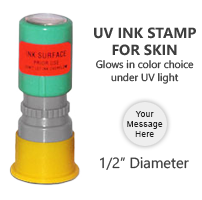 The colorful designs can help staff tell the difference between UV stamps and non-UV stamps you may have on hand. Stamps can be customized to feature a desired phrase or image at no extra cost. They are also refillable so you can use them for thousands of impressions. 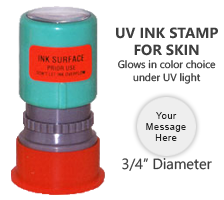 We also offer hand-held UV lights, as well as replacement bulbs, for a portable way to check for invisible ink stamps. Add some UV fun to your next event with these great options! At Rubber Stamp Champ, we are experts in creating custom stamps of exceptional quality. With over twenty years of serving customers, we are proud to be your source for all your stamping needs. If you have any questions about any of the products we offer, our team would be happy to assist you further. Call or order online today! Bottle Sizes Available: 1/2 oz. | 1 oz. | 2 oz.